Real photo postcard of a young boy identified on the address side as Harland Erickson. 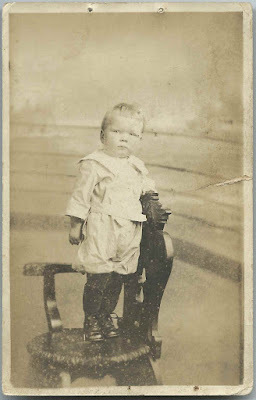 Since there are several possibilities for a Harland Erickson of about the appropriate age, I'm hoping that someone will recognize this photograph from family photographs. The RPPC was found with photographs from the Brockton, Massachusetts area. 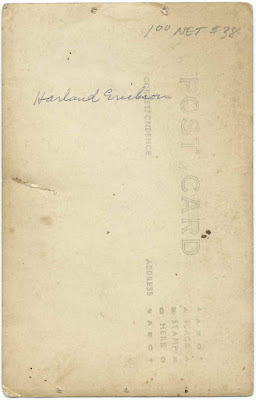 Perhaps Harland was Harland Forrest Erickson, born September 4, 1917 at Middleborough, Massachusetts, the son of Herbert F. Erickson and Caroline (Bryant) Erickson. This Harland married Myrtle Florence Darling, daughter of Lester C. Darling and Hannah F. (Baker) Darling. Harland and Myrtle had several children. Harland Forrest Erickson died in 1988 in Texas, where at least two of children resided, and Myrtle in 2001 in Massachusetts. See another post that features a photograph of Kenneth Erickson by a Boston, Massachusetts studio. Kenneth may have been Harland Forrest Erickson's brother, Kenneth Bryant Erickson. If you have corrections and/or additions to the information on Harland Forrest Erickson, or if you recognize the boy as another Harland Erickson, please leave a comment or contact me directly.